Colour slide of front doors to terrace flats adjoining houses in Farmborough Netherfield possibly in the 1970s. Red doors with distinct circular windows and grey walls. 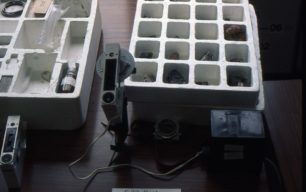 The flats pictured are numbered 220 and 218 from top to bottom, The house adjoining is 216. Colour slide of front doors to terrace flats adjoining houses in Farmborough, Netherfield possibly taken in the 1970s. 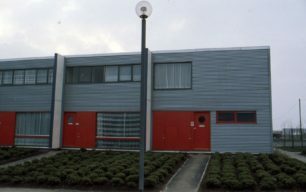 Red doors with distinct circular windows and grey walls. 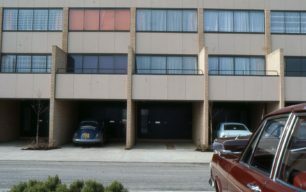 The flats pictured are numbered 220 and 218 from top to bottom, The house adjoining is 216. 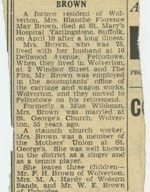 Newspaper clipping (date and title unknown) showing article written about Mrs. Blanche Brown’s death entitled ‘Former Wolverton resident Late Mrs. B.F.M Brown’. 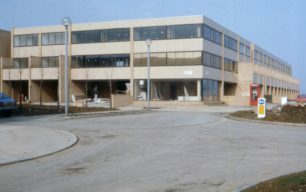 Colour slide of Gibbwin in Great Linford under construction, possibly taken in the 1970s. Shows peachy orange roofing. 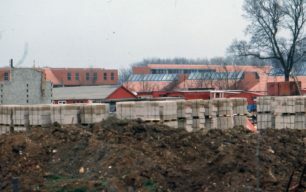 Mostly obscured by stacks of pale grey bricks and a mound of soil in the foreground. 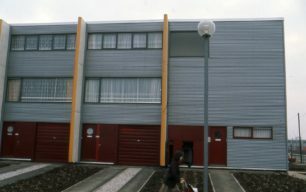 Colour slide of three-storey houses in Fishermead possibly taken in the 1970s, with balconies, alcove driveways and parked cars. 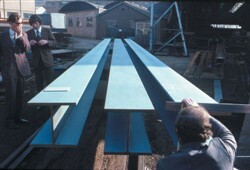 The CMK team visit Boulton and Paul Steelworks in Middlesbrough c.1975 to determine the steel specification for the columns. 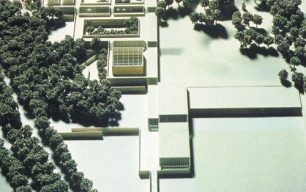 John Donat’s photograph of the building model of the Gallery in Park. 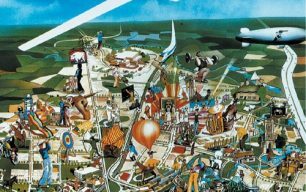 Philip Castle’s colourful poster of activities at the proposed City Club. 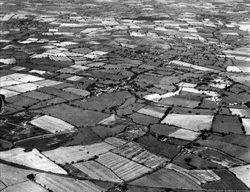 It portrays the Club as offering a huge range of activities from sports to balloon flights, circuses and music.